Located on Queensland’s sunny Gold Coast, Varsity Lakes is a well-loved holiday destination located between Burleigh and Robina. 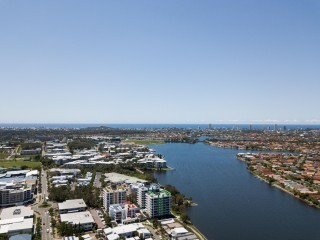 Known as ‘Stephens’ prior to the early 2000s, the area is an amalgamation of an old Gold Coast suburb named Andrews, as well as a portion of Robina. Guests visit the area for its close proximity to beaches, the city and the popular theme parks; Sea World, Warner Bros Movie World, and Movie World. Varsity Lakes also has several local attractions, offering guests the opportunity to hire bikes and enjoy the outdoors, visit a micro-brewery, or enjoy the multitude of great local food that is available. Skateboarding is particularly engrained in local culture, with well-known skate parks open to the public, including a park visited and skated by famous skateboarder Tony Hawk. The local love of the outdoors has led to regular community sporting events which are attended by locals and visitors alike, such as fun runs and cycling events. Events such as Varsity Lakes’ Winterfest, which is held each July and August, also draw visitors to the area, offering a showcase of local music, food, performance, and film, as well as the opportunity to experience a sense of the local community. Guests also choose to stay in Varsity Lakes for festivals and events that are held close by, such as the Australian Longboard Titles which are held on the Tweed Coast in August. 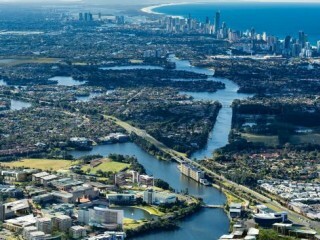 International or domestic guests travelling to the area via plane can fly into the Gold Coast airport and reach Varsity Lakes via taxi, shuttle service, or car rental, which is available on-site. Dry, sunny weather in the area means that travel is consistent throughout each season. Peak periods generally fall in the summer months, particularly on weeks that line up with the various state school holidays. During the winter months, visitors who are looking to escape for a holiday in the warmer weather travel from the cooler southern states. Varsity lakes has a range of accommodation options on offer, including serviced apartments, hotels and holiday parks. In total, the area has 78 accommodation options and food services for visitors, employing 11.5 percent of Varsity Lake’s 15,830 local residents.